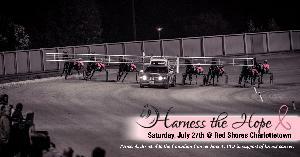 This year marks our 1st annual Harness the Hope fundraiser on Saturday, July 27, 2019. Red Shores Racetrack & Casino at the Charlottetown Driving Park is acting host for this amazing event that boasts infectious energy, passionate hearts and of course raises awareness and funds for the Canadian Cancer Society of PEI in support of breast cancer. This will be an evening packed full of excitement for the entire family with live action harness racing, prize draws, auctions, presentations and more.